Crowning a point 500 feet above where the Golfo Dulce meets the Pacific Ocean, nestled in the unspoiled jungles of Costa Rica’s Osa Peninsula is a paradise found. Bosque del Cabo is a premier Costa Rica Eco Lodge offering a romantic rainforest getaway and a naturalist’s dream come true. 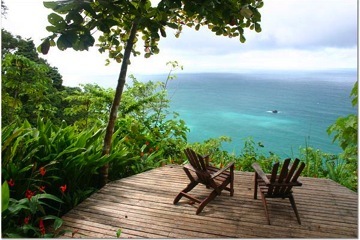 Located in a unique and fortunate position at the very tip of the Osa Peninsula in the southern Pacific region of Costa Rica, this 750+ acre forest reserve features private, spacious bungalows and gorgeous houses perched atop the cliffs of Cabo Matapalo, each with beautiful ocean views, tropical breezes and the rainforest at your doorstep; or choose beautiful and rustic garden view accommodations surrounded by thriving rainforests. Hiking trails lead you through the forest to deserted beaches on both the Golfo Dulce and Pacific Ocean. Bosque del Cabo, which opened its doors as a hotel in 1990, is owner operated and dedicated to forest reservation. The Osa Peninsula is one of the most biologically diverse places on earth. 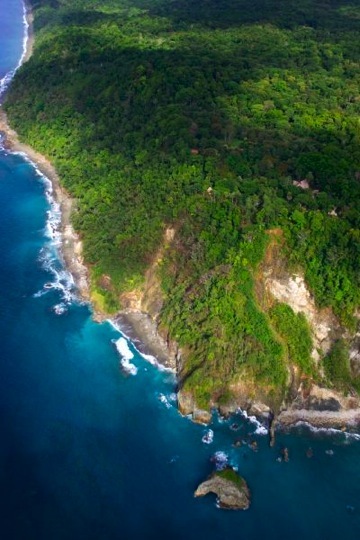 Boasting over 700 species of trees, 365+ species of birds (with several endemic species), 117 species of reptiles, and almost 10,000 species of insects, the peninsula is home to 100,000-acre Corcovado National Park, known as the crown jewel of the Costa Rican national parks system. Bosque del Cabo Rainforest Lodge offers a rare opportunity to comfortably vacation among all this rugged natural splendor. At the end of our mile long driveway, you’re transported to a private Eden joining the raw nature of the rainforest to the tranquil beauty of manicured grounds and breathtaking views. The nature lodge’s lush gardens, full of tropical fruits and flowers, attract many of the colorful resident wildlife species. Residents of the area include flocks of macaws, toucans, and parrots. 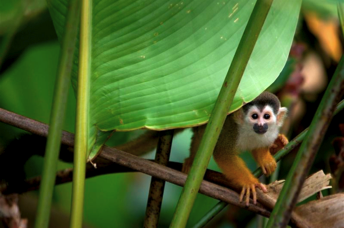 Monkeys, coatis, kinkajous, agoutis, and sloths are daily visitors. Peccaries are often seen, and from time to time even jungle cats (like pumas, jaguarundis, ocelots and jaguars) are spotted on the property. 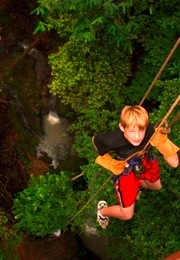 refreshing natural pools and waterfalls, along with an abundance of Costa Rican wildlife. You can spend your days hiking and exploring the natural beauty of Bosque del Cabo and the surrounding area, whiz through the air on our zipline into the tree platform, take a walk across our suspension bridge to the Tropical Garden, or just relax by the pool or on your deck, sip a tropical drink, and watch the macaws fly by. Our newly renovated solar-powered restaurant serves delicious meals in a friendly (and eco-friendly!) atmosphere. 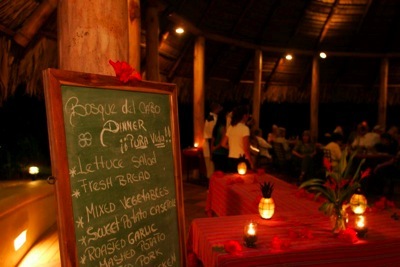 Breakfast offers a variety of fresh, local fruits and your choice of typical Costa Rican or North American fare. Lunch in house or have it packed to go. Dinners are always a special event; everyone gathers to share stories of the day, while enjoying a plentiful and delicious gourmet meal served by candlelight. Bosque del Cabo has ten beautifully crafted thatched-roof bungalows; each is privately set among lush gardens; offering stunning ocean views, modern bathrooms with delightful outdoor garden showers, and porches furnished with hammocks and easy chairs. Set high on a cliff overlooking the confluence of the mighty Pacific and the Golfo Dulce, these romantic nature lodge bungalows are stirred by warm tropical breezes that echo with the rhythms of the pounding surf below. 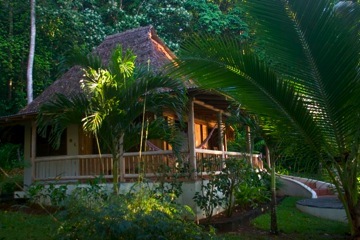 And for the ultimate in jungle living, Bosque del Cabo has two rental houses: Casa Blanca and Casa Miramar. Casa Blanca, a well-appointed 2 bedroom/2 bath house has a fully-equipped kitchen, living room area, large wraparound porch with an amazing view of the Pacific Ocean, and 2 large bedroom suites on either side of the house. Casa Miramar offers a home with an artistic layout of three unique “casitas” featuring three bedrooms, 2 full bathrooms, a fully equipped kitchen, living room area, and many porches and observation decks with amazing sunset views. Bosque también tiene un hermoso Garden that offers garden accommodations (one rental house, Casa Teca, and two cabinas, Cabina La Paz and Cabina Almendra), a wildlife pond and features El Palenque, an open rancho restaurant/bar & bird watching facility. The Tropical Garden may be accessed by crossing over our 300-foot long suspension bridge. The bridge spans a 75-foot deep rainforest gorge that has a lovely creek running along the bottom. And all of our accommodations offer hot water, screening and/or mosquito nets, maid service and solar/hydroelectric power. Rainforest trails and pristine shores are steps away from your porch; access to a great variety of habitats and activities are nearby, including the wild Pacific coast with tide pools, waterfalls, and calm sandy gulf beaches. At our Costa Rica Eco Lodge, you can also enjoy surfing, kayaking, waterfall rappelling, tree climbing, deep-sea fishing, boat trips, hiking, horseback riding, and our tree platform & zipline!